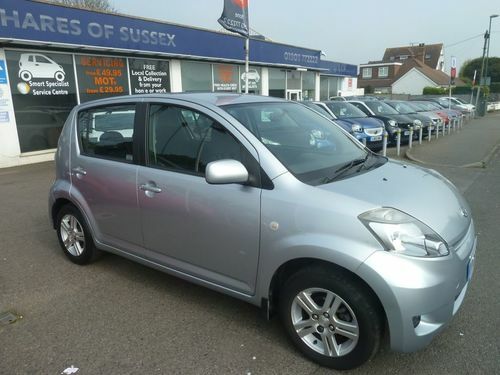 Get behind the wheel of this Daihatsu SIRION 1.3 SE with a 1.3 Litre Petrol engine and Automatic transmission. This second hand model from our dealership in London has low mileage. This vehicle is in London, however this dealership might be able to deliver it to your region. Simply call them to learn more. Contact our dealership for further information. Visit the customer care office at this dealership to arrange an appointment and view this used COPEN 0.66 VIVID at your earliest convenience. 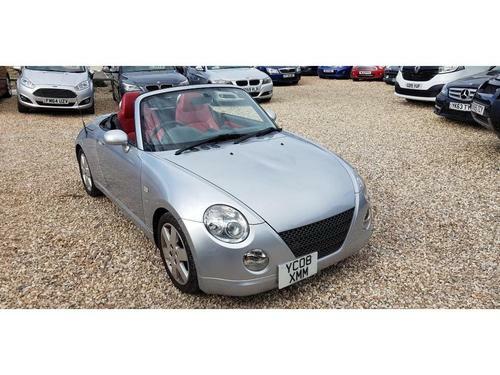 Get in touch with Essex Trade Sales for a closer look at this 2 door Manual COPEN 0.66 ROADSTER designed with a 0.7 Ltr Petrol motor. This second hand model in the Ilford area hasclocked up 68000 miles and is finished in Black. Be the first to have a chat with Essex Trade Sales in Ilford to book a test drive in this COPEN 0.66 ROADSTER priced at just £2,895. 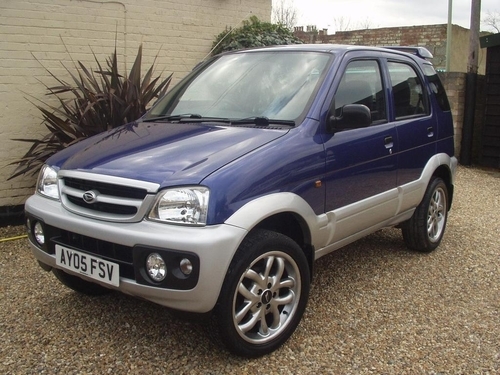 This used Daihatsu TERIOS from Essex Trade Sales in Ilford contains a 1.3 Ltr Petrol motor with Manual transmission and it has clocked up 88000 miles. Making contact with a member of the knowledgeable finance team is the starting point in becoming the next owner of this SUV car. Available to test drive at Xclusive Cars is this 1.3 SPORT ECOSSE SUV SUV with 93250 miles on the clock, Automatic transmission and 1300 CC Petrol engine. Want to find out more about this motor? Simply get in touch or come over and speak to the sales dept at Xclusive Cars. This Daihatsu TERIOS 1.3 SPORT available from this dealership in Aldershot priced at £2,495 has 64000 miles on the clock and has been finished in the shade of Blue. This dealership is in the Aldershot area. 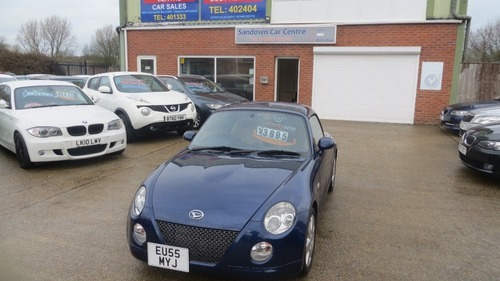 Email or call to organise a viewing..
Now on offer - Blue 2 door, Daihatsu COPEN 0.66 VIVID CONVERTIBLE that has a Manual gearbox and 0.7L Petrol engine. Phone Camberley Motorhouse to obtain more information about all of the features and specifications this COPEN is included with. Now on display at this car dealership located in Saffron Walden is this Daihatsu SIRION with Manual transmission and a 1000 CC Petrol motor. Debden Road Service Station located in Saffron Walden also gives you the possibility to spread your payments with finance, your affordable monthly payment plan could start off at only £50 monthly. On offer at the fabulous price of only £12,000 is this Daihatsu FOURTRAK 2.8 TD LIMITED EDITION which has a 2800CC Diesel motor with Manual transmission. This second hand one now in stock at our dealership in Milton Keynes has 32000 mi clocked-up on the dashboard. Pictures can only give you half of the story - book to test drive this Daihatsu. This 3 door FOURTRAK has a 2.8l engine and a Manual transmission. It is now on the market and ready for its next owner to take home priced at just £10,000. Email or call the merchant Praters Of Hollingdon in Milton Keynes now and learn more about this SUV second hand car. 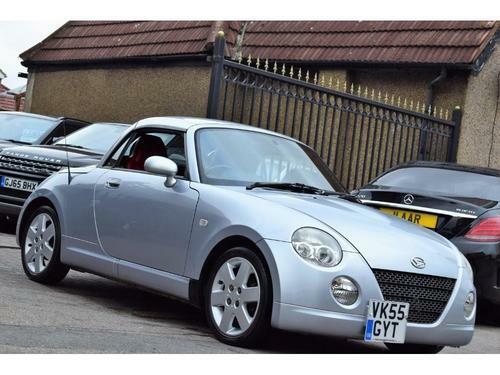 Take a closer look at this Daihatsu COPEN that has Manual transmission and a 659CC Petrol engine. This second-hand model has got 69000 miles on the dash. If you are interested in getting this car or would like to enquire, send an email to Pavillion Car Sales Ltd in Brighton. On the market and ready for its next owner to drive away is this second hand, Silver Daihatsu SIRION that has Automatic transmission and a 1.3 L Petrol engine. Get it at the incredible price of only £2,975 from Hares Of Sussex in the Littlehampton area. To enquire about becoming the new owner of this SIRION 1.3 SE 5D AUTO, get yourself down to this supplier or call to talk with one of the knowledgeable advisers at Hares Of Sussex. 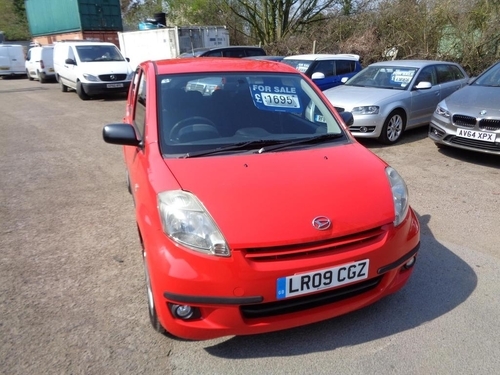 At the marvellous price of just £2,975 or with affordable payments starting off at around £68.63 per month, this Daihatsu SIRION 1.3 SE 5D AUTO could be yours. This second hand CHARADE from Baz Autos has done 45000 miles and is fitted with a 1000 cc Diesel motor with Manual transmission. For the total price of just £1,500 or on finance starting off at only £50 every four weeks, you could be the one behind the wheel of this used Daihatsu CHARADE 1.0 TD CX . Simply contact Baz Autos in Bicester before it's gone. 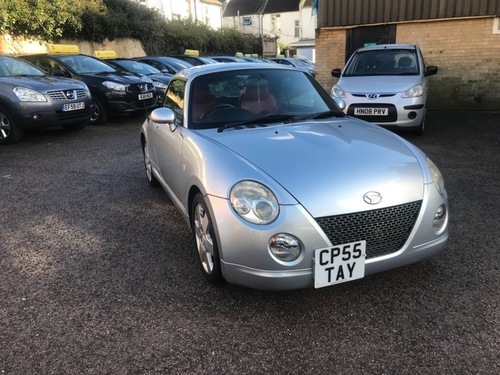 With Manual transmission and a 1298CC Petrol engine, this second-hand Daihatsu comes in the tone of Grey and has 98000 miles clocked-up on the dash. At Assured Car Sales in Swindon, this second hand car is being advertised at the marvellous price of only £3,990. To assist you in the purchase of this vehicle, we can also offer you affordable instalment plans starting off at £92.05 each month. Up for sale is this Daihatsu that has a Manual transmission and 1.3 Ltr Petrol engine. This dealership is in Swindon. Book a test drive today. 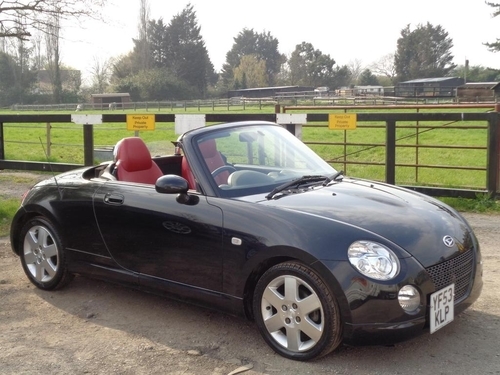 Have this used COPEN VIVID for £3,995. Finance plans start out at £92.17 a month for this car with 44000 miles on the dash, 600 cc Petrol engine and a Manual transmission. As you can expect from a car in this class, this COPEN VIVID provides its driver with a large variety of additional features and specifications to enhance your driving experience. To be the next happy owner of this vehicle, come down to chat to one of our advisers and be the one that gets this fantastic bargain before it's too late. 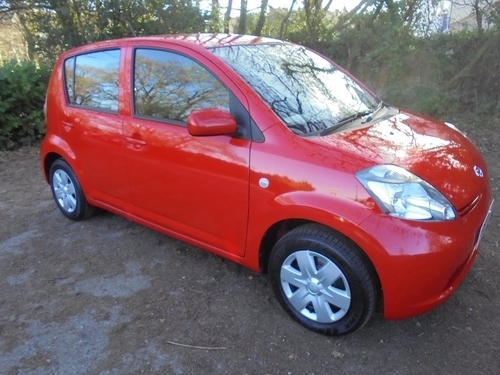 At only £2,995 is this Daihatsu SIRION 1.3 S featuring Manual transmission with a 1.3l Petrol engine. This second hand model has done 31000 miles. Get on the phone with the informative customer care office to learn more about this Daihatsu SIRION's specifications. Are you interested in owning a Daihatsu? Consider this second-hand one with low mileage from our dealership featuring Manual transmission with a 1.5 litre Petrol motor. 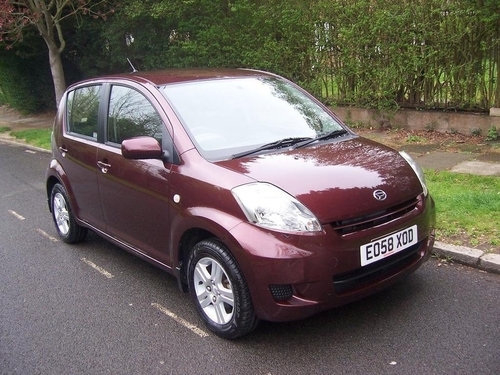 Finance this TERIOS with a loan starting out at only £115.24 every month. Simply get in contact and find an instalment plan that is tailored to your needs. Showing 1-18 of 63 items.